Everything to insure your exceptional stay in this beautiful setting is here!! !....an awesome massage chair, a powerful hot tub, 2 master suites with luxury king beds & private bathrooms, 4 additional bedrooms, 2 fully-equipped kitchens with quality cookware, designer furnishings, many comfortable sitting areas, expansive outdoor decks, fire pit, jetted Kohler bath tubs, children's playroom with playhouse and giant outdoor playground set. 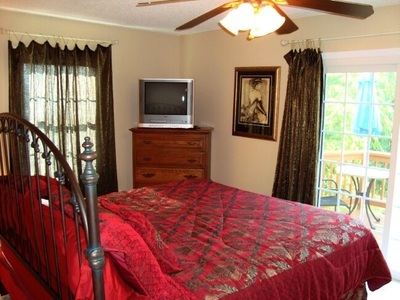 There are plush quality mattresses with sumptuous bedding, 8 televisions including the Media Room's 60" Smart 4K HDTV/DVD Blu Ray premium stations, huge movie library, high-speed wireless Internet connection, Foosball table, Play Station 3 with games, two 80 gallon hot water heaters for plenty of hot water, 2 gas log fireplaces, central heat & air conditioning, hidden wall safe, FREE long distance phone, and much more! 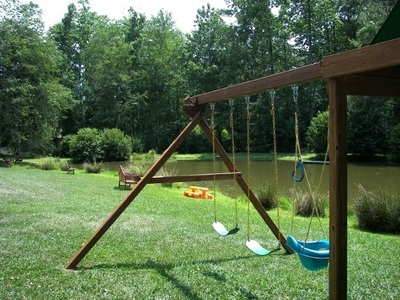 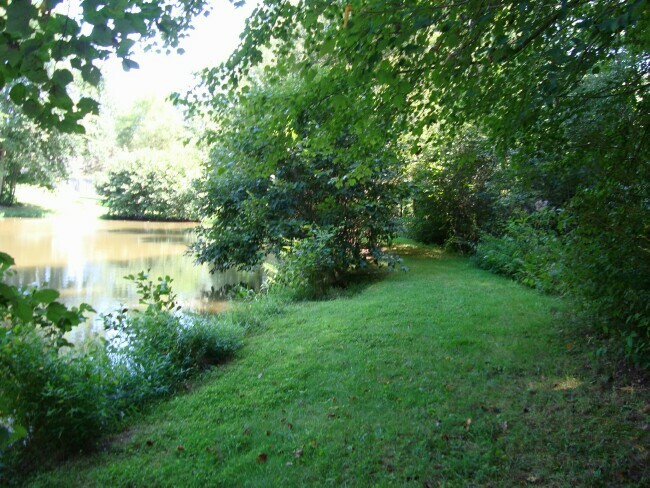 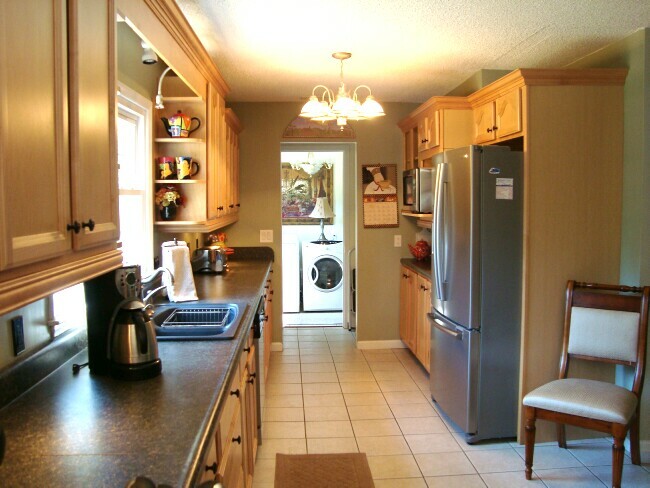 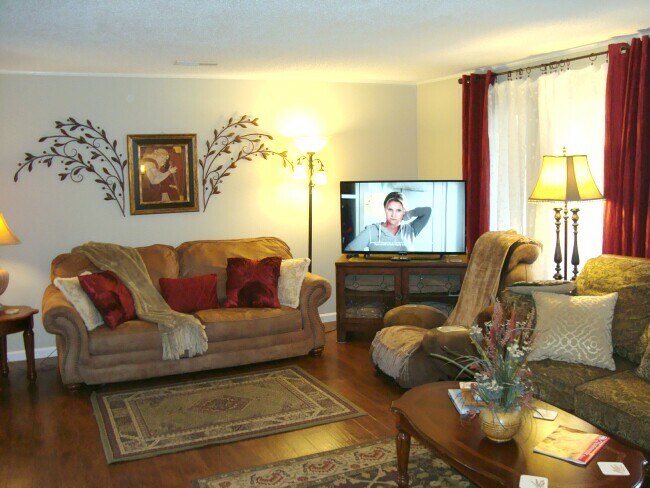 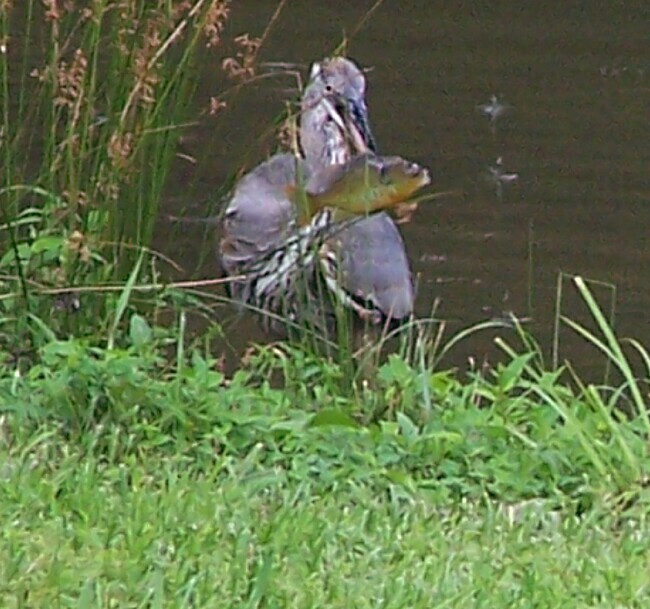 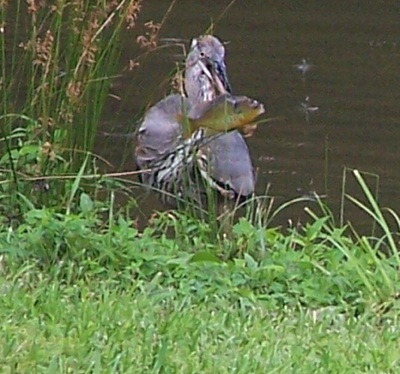 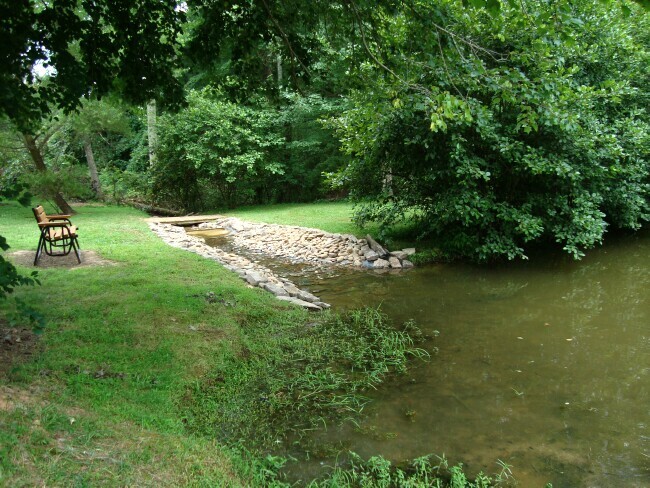 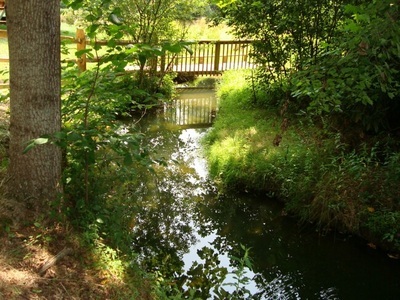 Enjoy the half acre wildlife pond and streams in your lushly landscaped 2 acre yard. 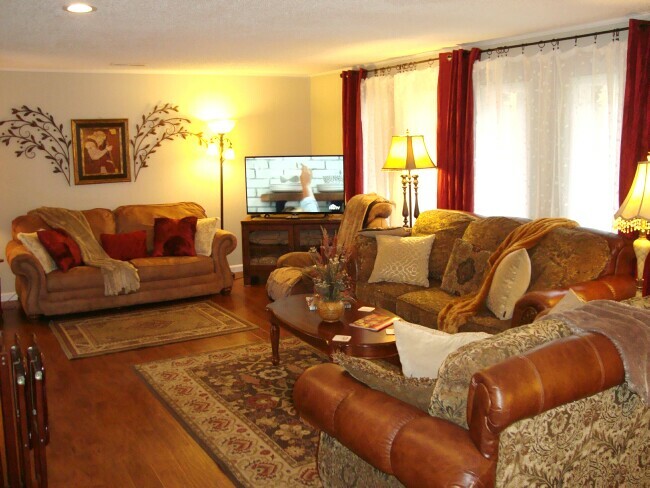 LOCATION: The home is located just two miles north of Hendersonville's historic downtown Main Street’s quaint shops, galleries & delicious restaurants. 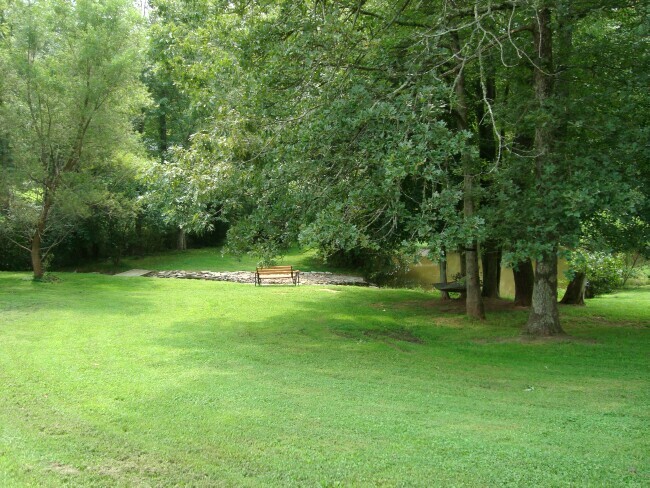 Only 1 mile away is the public Patton Park with nature trails, Olympic size swimming pool, skate board park, athletic field, racquet ball, basketball courts, playground, tennis courts and picnic area. 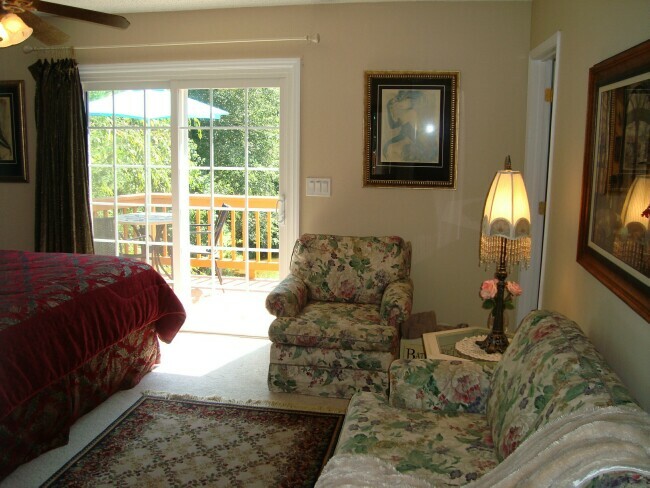 It's a quick 25 minutes to Asheville's Biltmore House and downtown area. 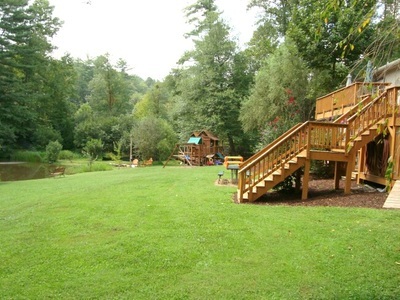 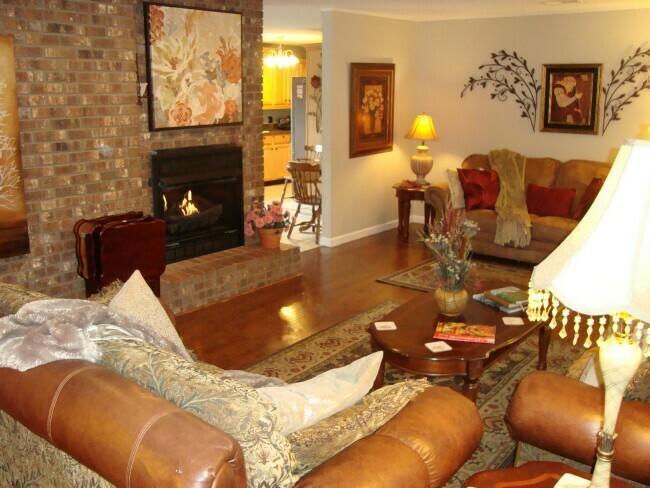 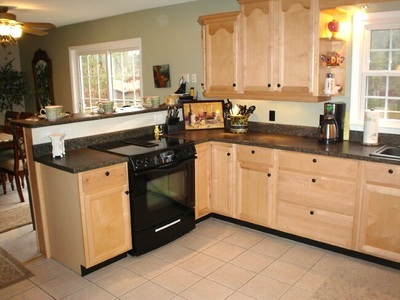 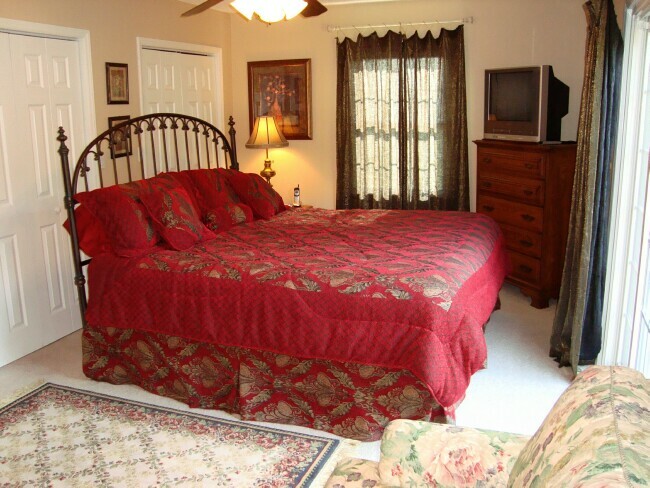 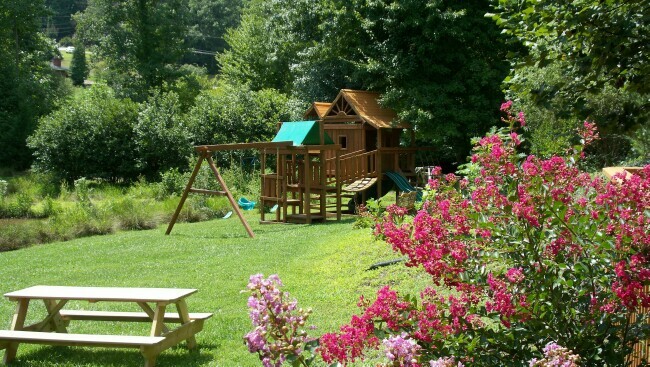 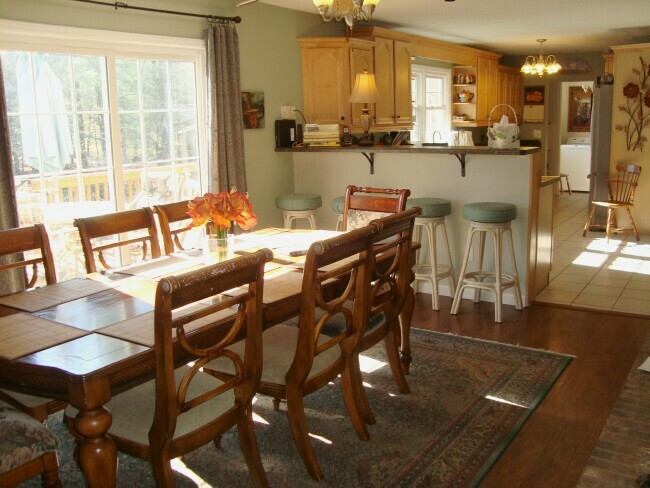 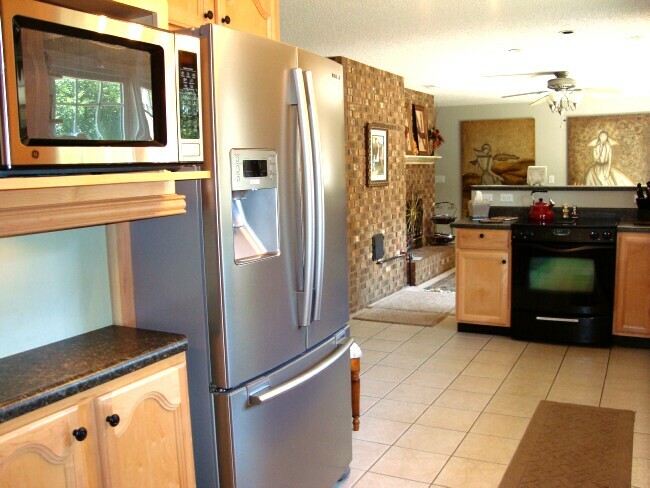 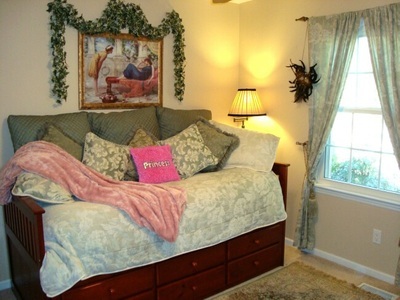 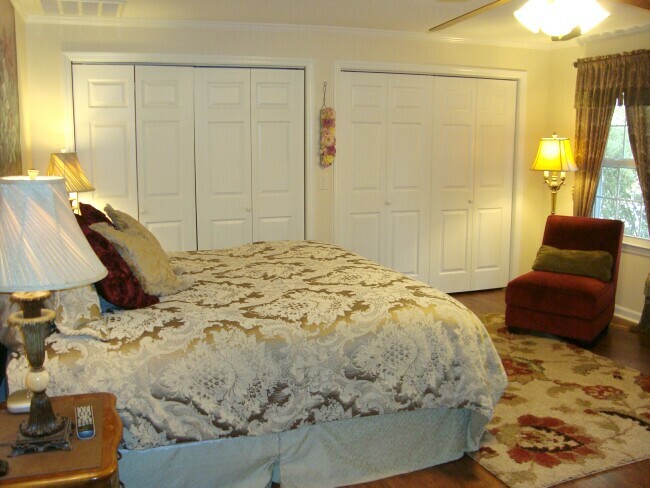 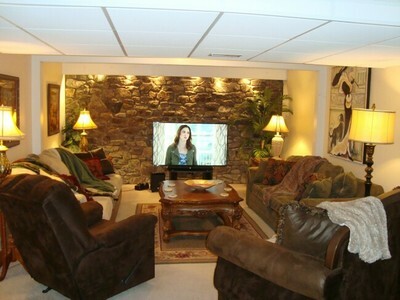 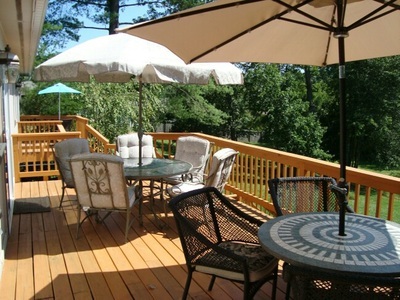 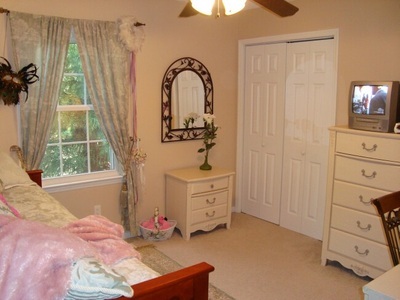 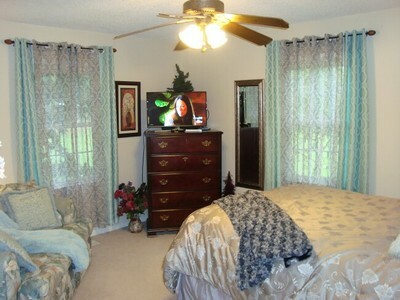 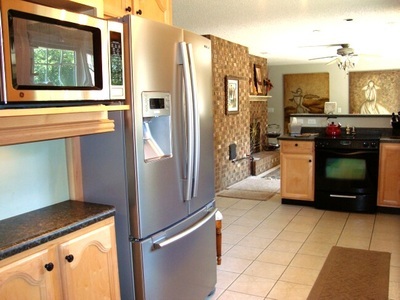 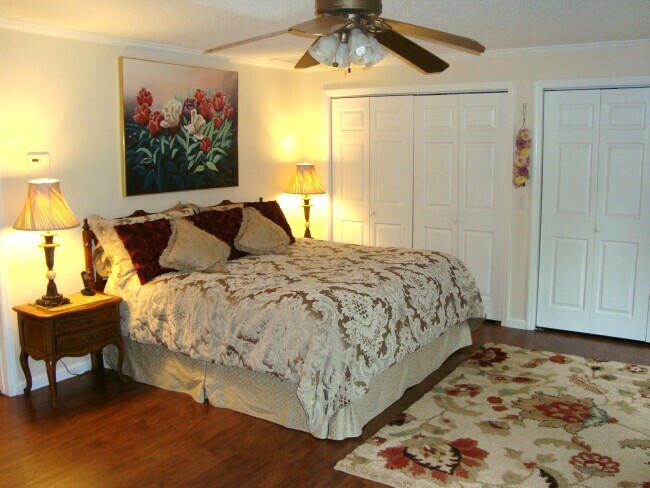 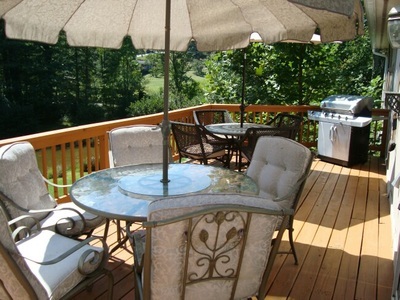 It's among the most convenient house rentals in Asheville North Carolina! LIVING ROOM: The living room offers three elegant comfortable sofas (1 is a queen sleeper), an awesome massage chair, a remote controlled gas log fireplace, exceptional artwork, and TV/DVD with expansive movie library. 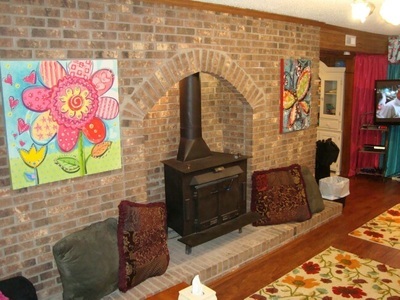 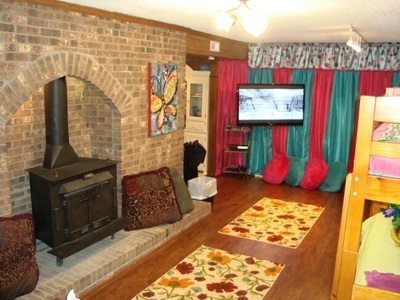 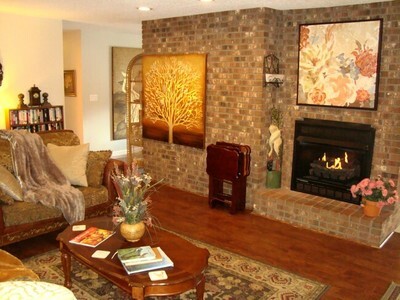 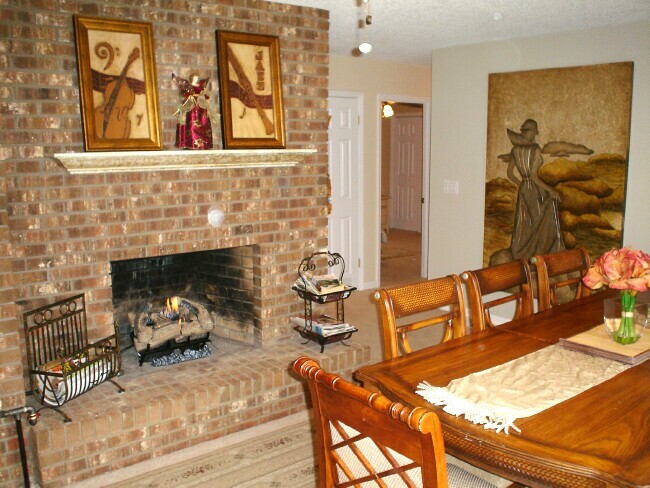 It is open to the kitchen and on the other side of the walk-around brick fireplace is the dining room with its own gas log fireplace. DINING ROOM: Open to the kitchen, the dining room is warm & inviting with a gas log fireplace in a beautiful brick wall, unique wall art and rich wood dining table & chairs. 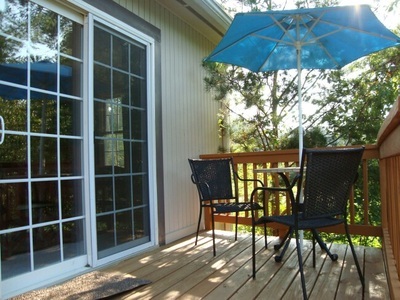 The sliding glass doors open to the patio tables and chairs for eating alfresco overlooking the pond. 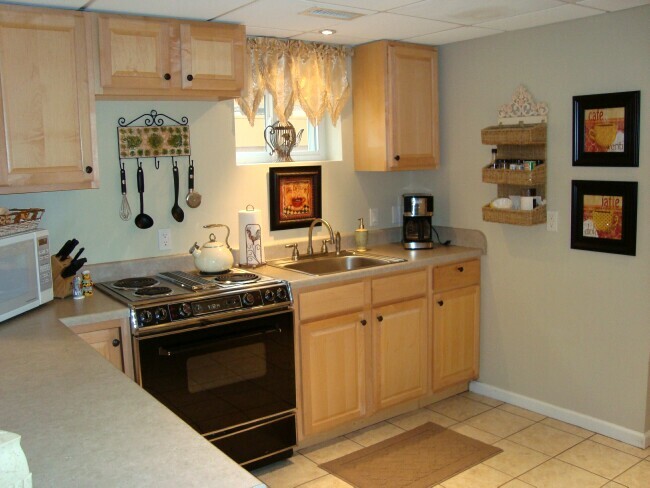 MAIN LEVEL KITCHEN: There is plenty of quality cookware, utensils, kitchen accessories & gadgets to please any chef when preparing meals for big crowds! 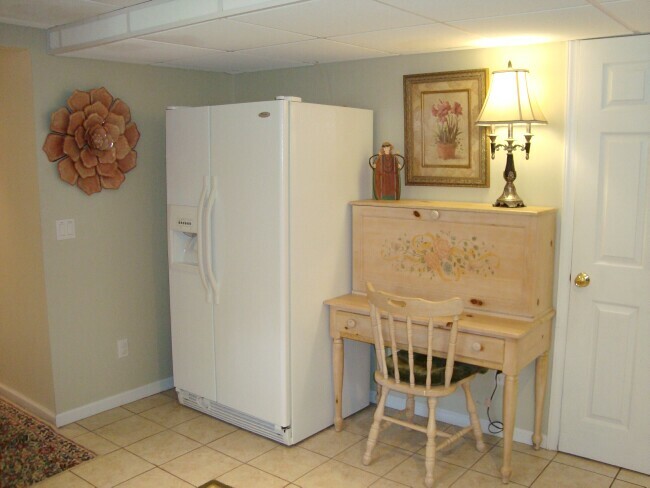 The refrigerator has water & ice in the door and a bottom drawer freezer. 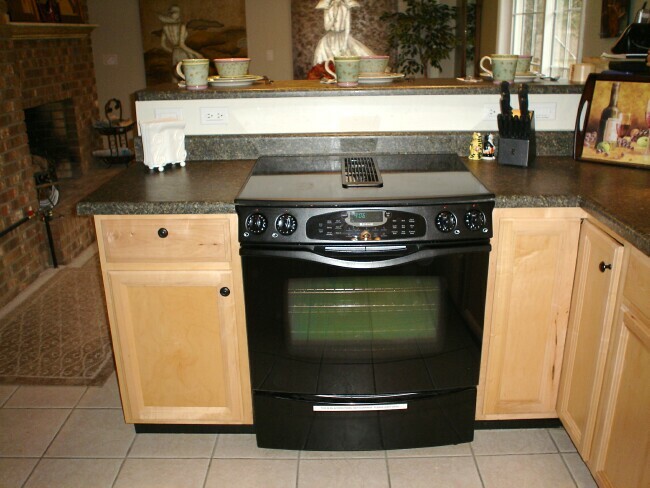 You have a JennAir down-draft ceramic glass cooktop with self-cleaning convection oven, dishwasher, microwave, and disposal. Enhance your meals by serving them on our lovely dinnerware and quality silverware. 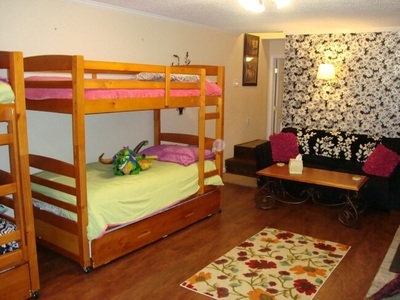 (Don't worry, kids have their own non-breakable plates, glasses & cutlery!) 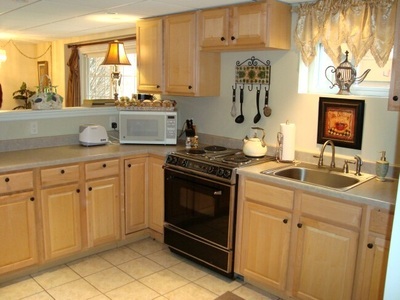 See the long list of kitchen amenities below. 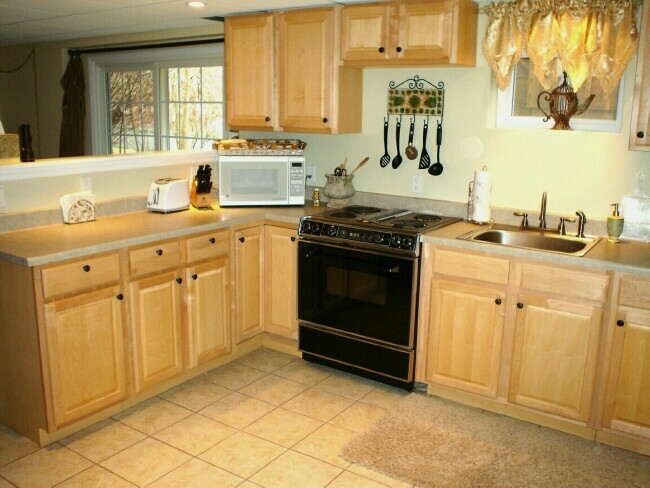 Don’t forget there is a second kitchen downstairs! You will also find TWO LAUNDRY ROOMS with full size washers & dryers, one on each level for your convenience. DOWNSTAIRS ROOMS INCLUDE: 1 Queen Bedroom, Dorm Bedroom (sleeps 8), 1 Full Bathroom, Media Room, Children's Playroom, Kitchen, Dining Area, Laundry Room, Covered Patio Deck with Hot Tub (There are queen sleeper sofas in both the Media Room & Dorm Bedroom & 2 twin air beds) This area is devoted to PLAY! 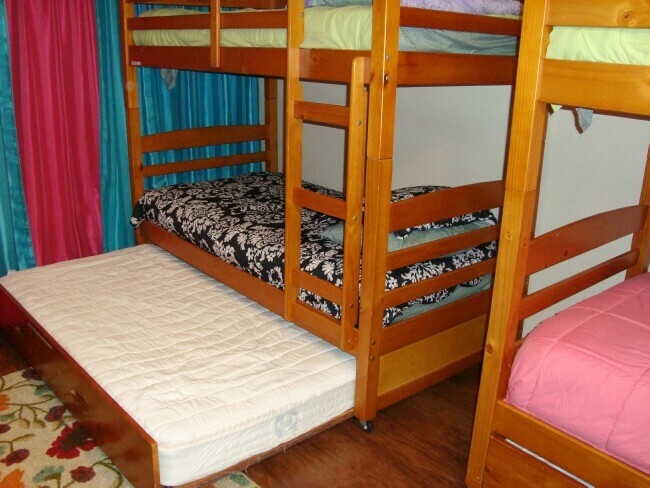 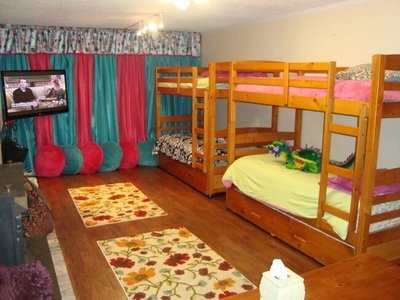 DORM BEDROOM: This generous size room has two sets of twin bunk beds each with a pull-out trundle sleeping 6. The queen sleeper sofa will sleep an additional 2 guests for a total of 8! Decorated in bright cheerful colors and textures, this room is warm and welcoming. Watch the 50" Plasma HDTV with Blu-Ray DVD/Playstation 3 game player or just around the corner in the kids playroom is a professional foosball table. 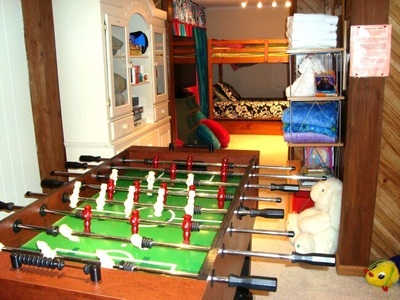 There is a Casio keyboard with headphones for private playing, has 100 rhythms, 100 instrument tones, and 100 songs built-in. It even shows hand and finger placements over a LED screen for beginner piano players. MEDIA ROOM, DINING AREA, SECOND KITCHEN & LAUNDRY Chill out in the Media Room with a Smart 4K 60" HDTV/DVD Blu Ray, premium stations & DVD movie library. 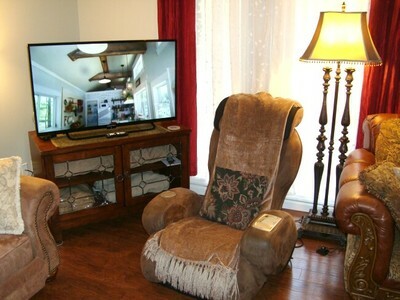 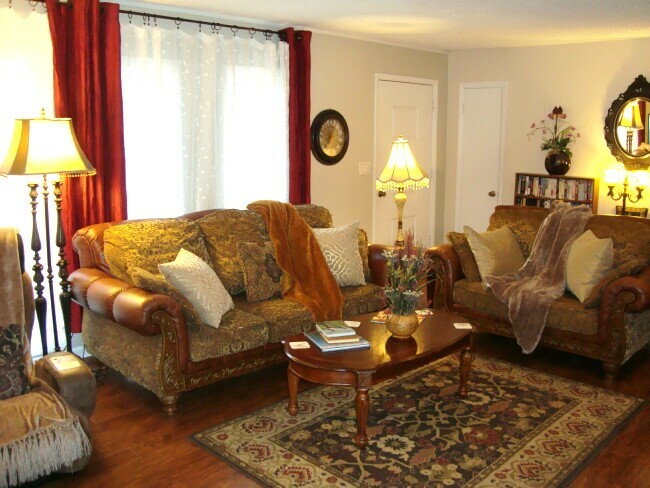 You have 3 extremely comfortable sofas (1 is a queen sleeper sofa) & recliner chair. 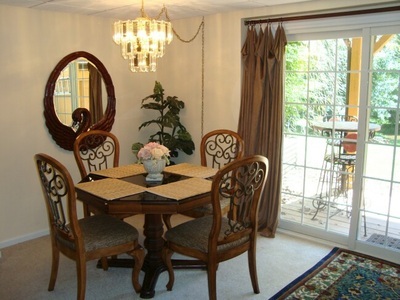 Play cards or games on the dining table at the end of the room. Serve refreshments from the second full size kitchen just off the Media Room. 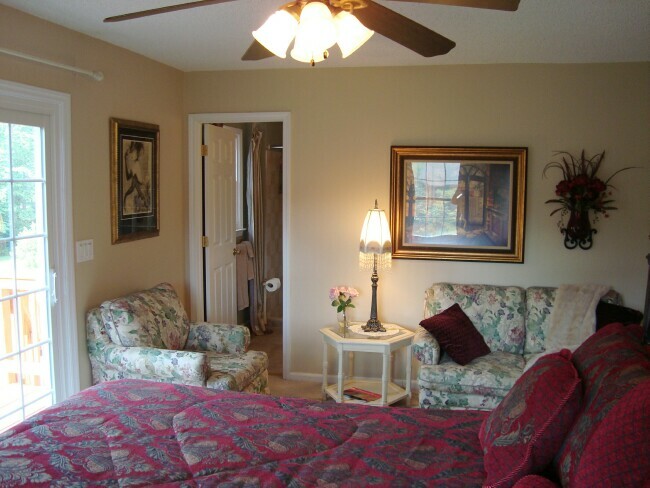 It's great to have a private area for early morning risers to have their coffee and breakfast while others sleep late upstairs. This second kitchen is also fully equipped with quality cookware, has JennAir oven, microwave and refrigerator with ice in door. 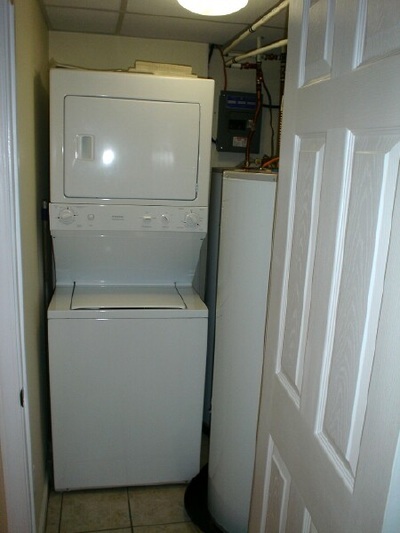 For your convenience there is a second washer/dryer on this level. FOR CHILDREN & BABIES: Always important guests at our homes, we provide plenty to keep children entertained and enough baby equipment so parents can travel lightly. 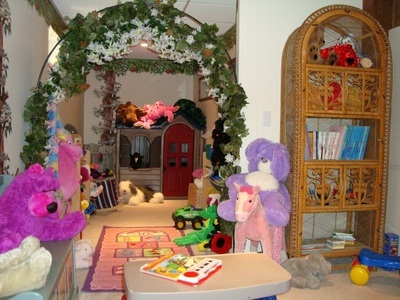 For babies there are two cribs with bedding, 2 pack-n-plays, 2 high chairs, 2 strollers, play pen, baby bath tub, cuddly stuffed animals and soft blankies. 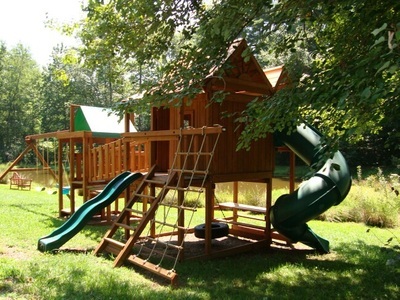 For kids there's an impressive outdoor playground with forts, slides, climbing wall, swings & more. 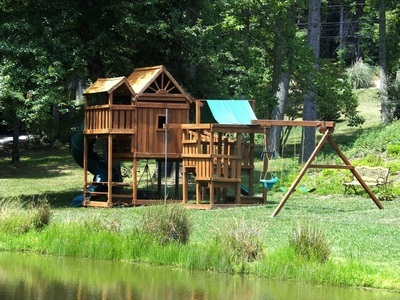 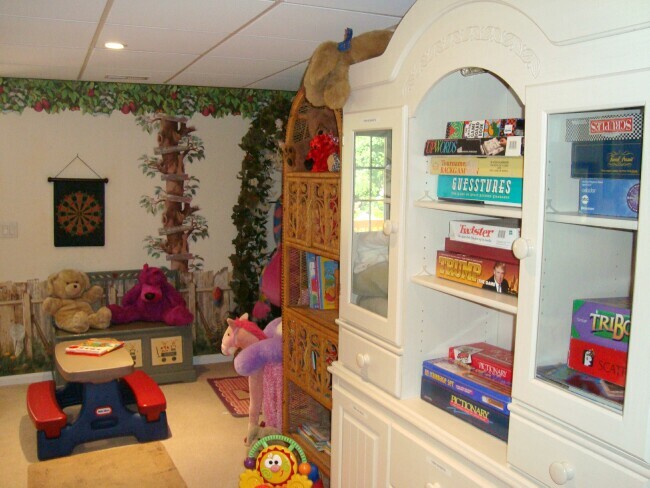 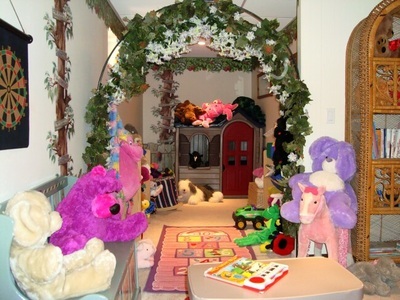 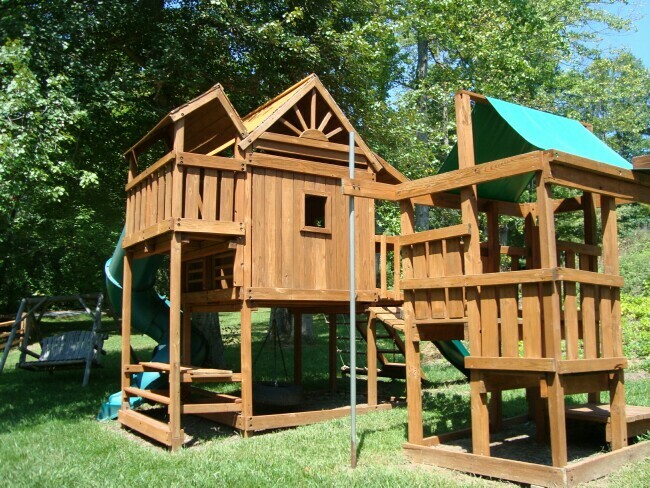 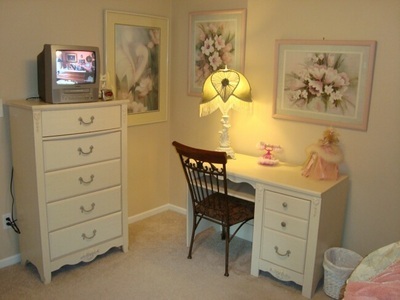 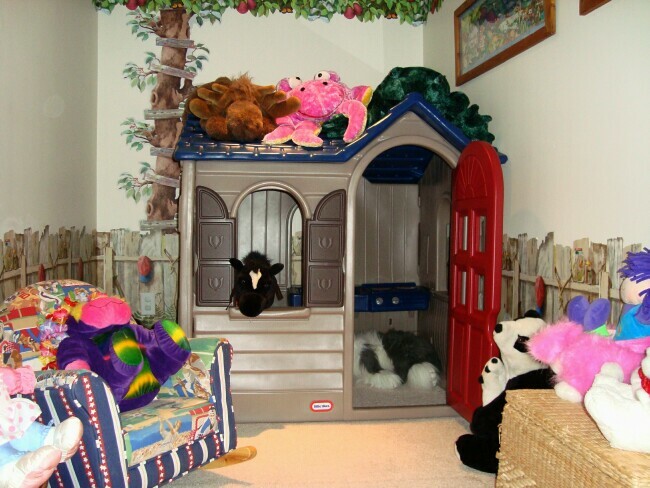 CHILDREN'S PLAYROOM WITH PLAYHOUSE: This delightful playroom will keep children entertained for hours! 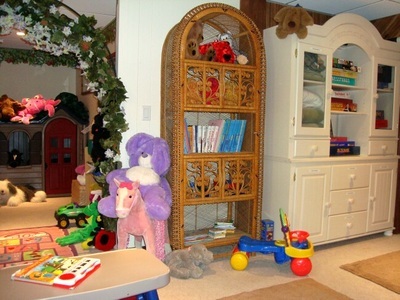 There is a colorful walk-in playhouse, toy kitchen, picnic table, books, toys, building blocks, leggos, hop scotch, stuffed animals, board games and much more to intrigue a child's imagination! HOT TUB AND OUTDOOR "LIVING ROOM" COVERED DECK You'll be spoiled with the fabulous 6 person hot tub with 4 motors, 33 jets and individual controls! 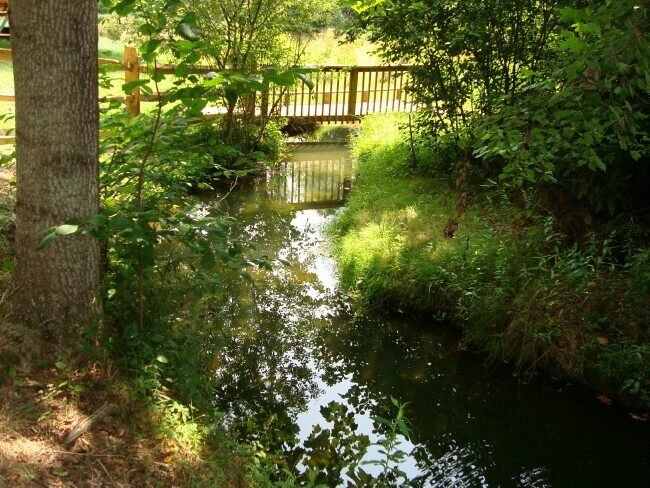 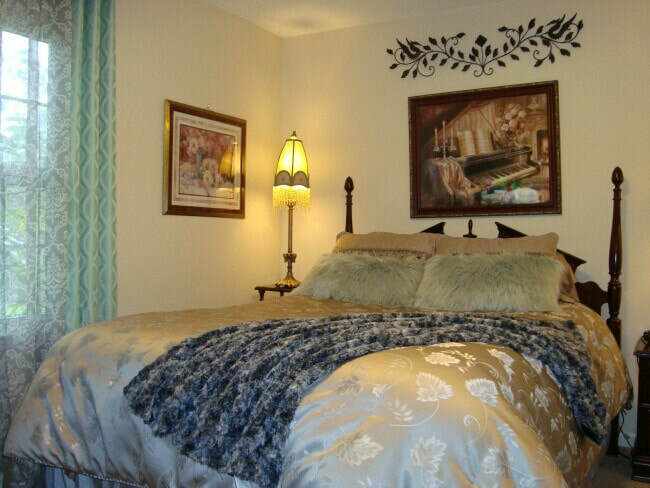 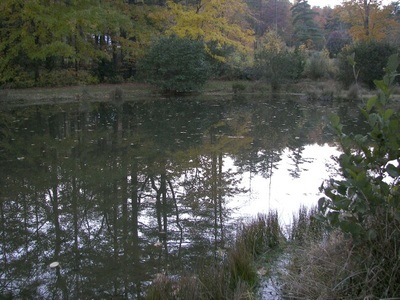 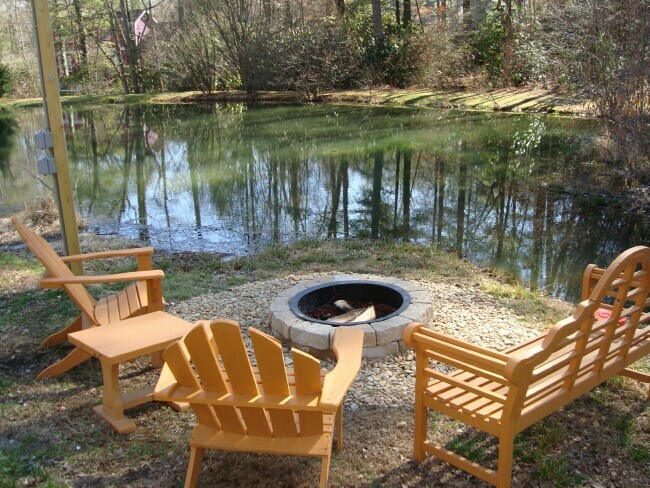 Unwind after a day's hiking or shopping with the soothing hot water and gaze at your lovely private pond and streams. 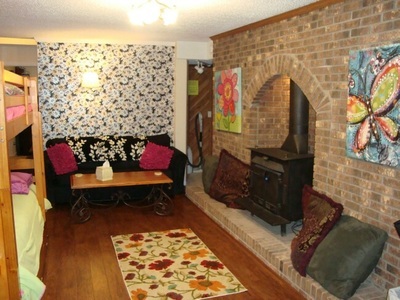 Also under cover is a lovely outdoor patio area with comfortable sofa and chairs. 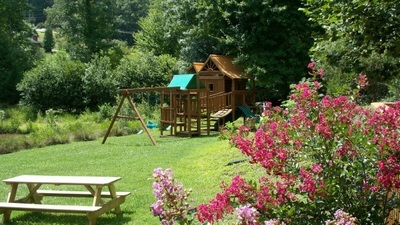 It's a great place to visit or watch the kids play on the lawn or outdoor playground. EXTENSIVE PLAYGROUND: Talk about hours and hours of fun for kids! This fabulous playground is a big hit with youngsters! 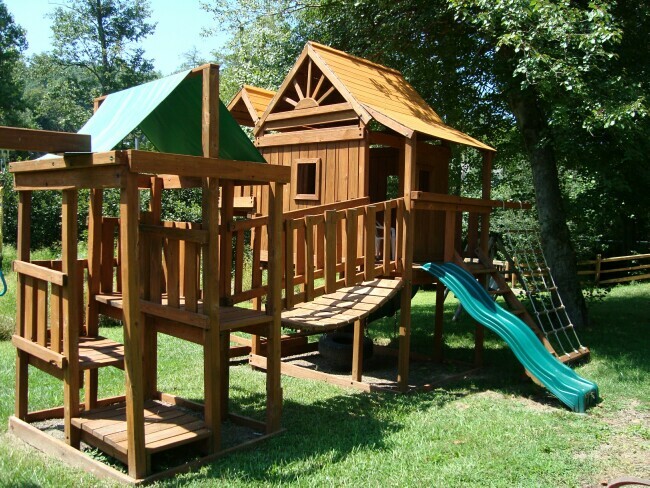 There are two slides including an enclosed spiral slide, two forts with a clatter bridge between them, a tire swing, a climbing wall, a picnic table and swings including a toddler swing. Parents can sit in the several benches & picnic tables under the shade of trees to watch them play. 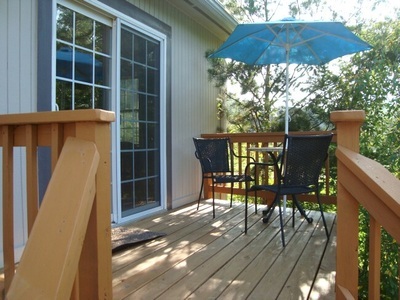 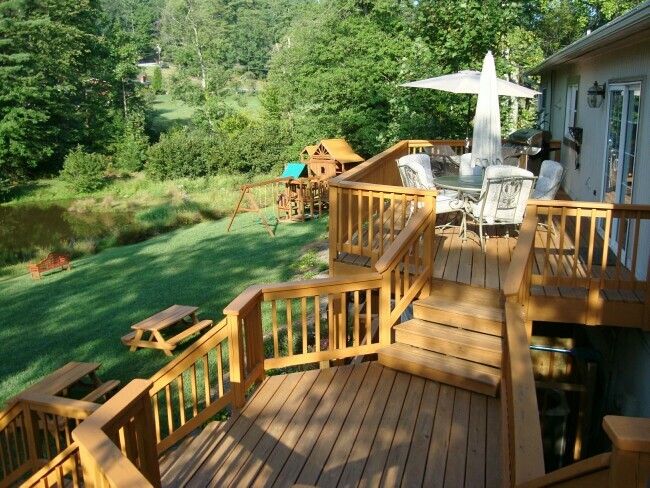 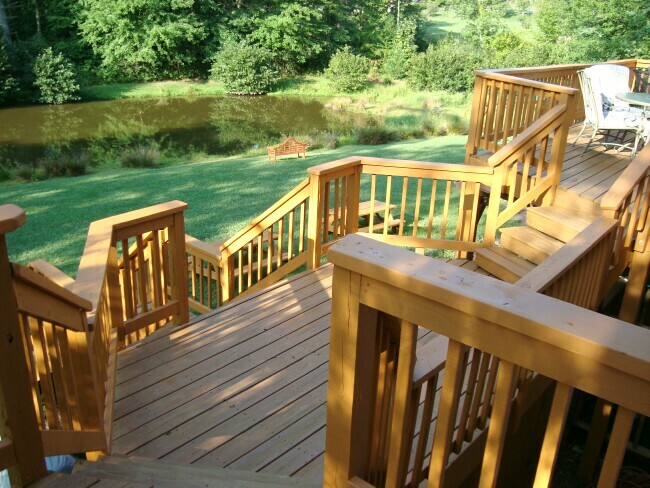 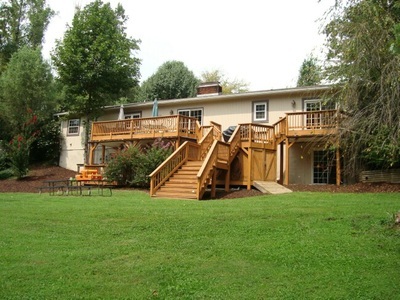 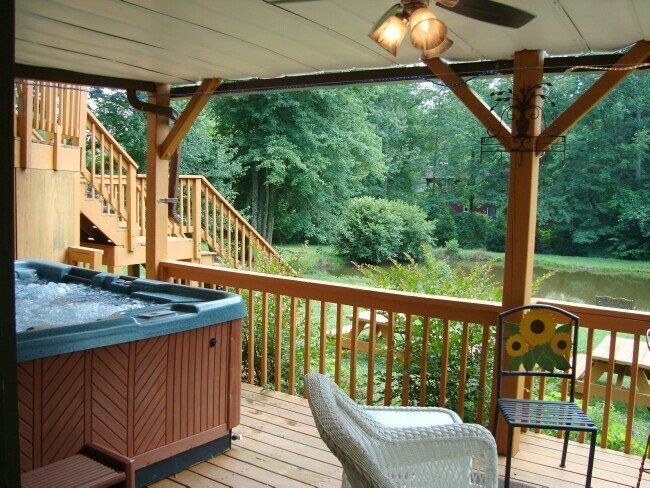 DECKS OVERLOOKING THE POND: There are plenty of tables and chairs on the various outdoor covered & uncovered decks overlooking the peaceful pond and streams. There are picnic tables, benches and fire pit on the lawn areas by the pond. 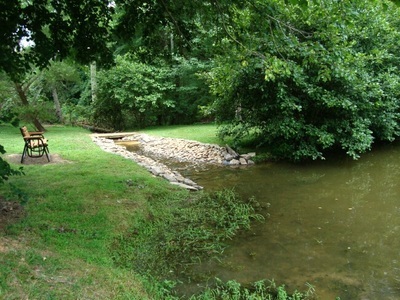 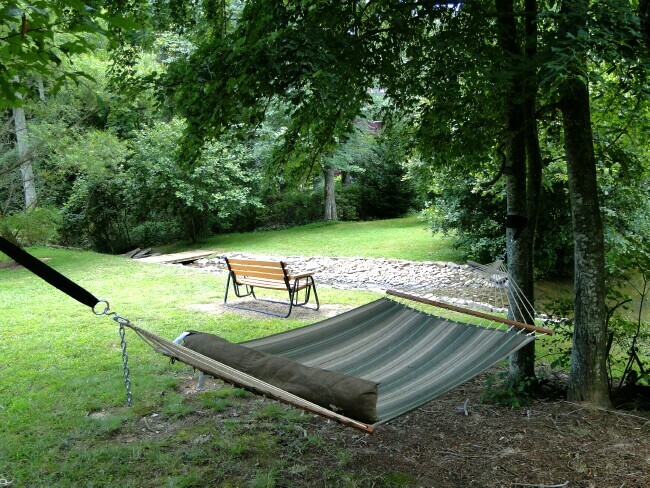 TWO LANDSCAPED ACRES: White Stone Manor sits in the center of two beautifully landscaped acres. There's a lush pathway around the lake, plenty of room to play lawn games, sit on the benches & picnic tables throughout the grounds, enjoy a marshmallow roast at the fire pit. 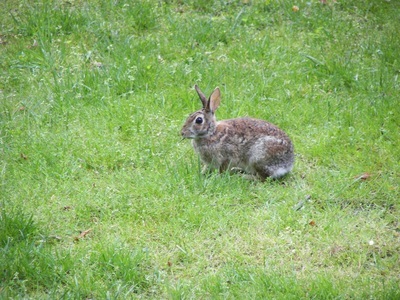 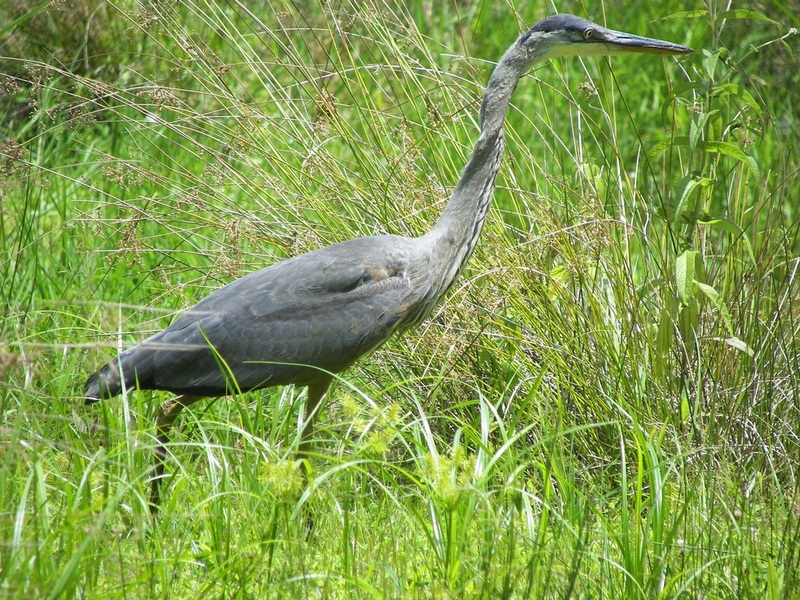 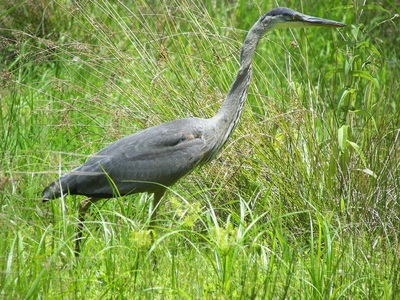 Best of all, you can enjoy the natural wildlife habitat of our stream-fed pond. 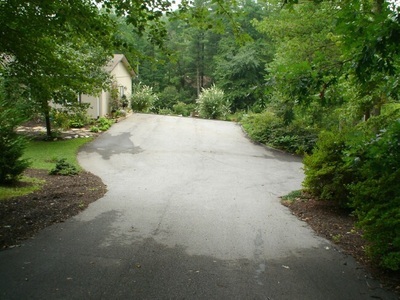 The large driveway has plenty of parking and is lined with lighting at night. 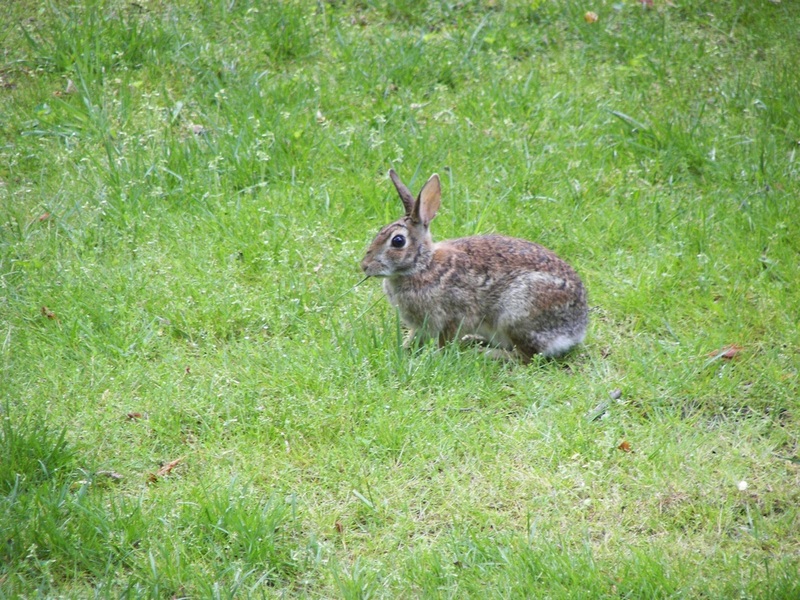 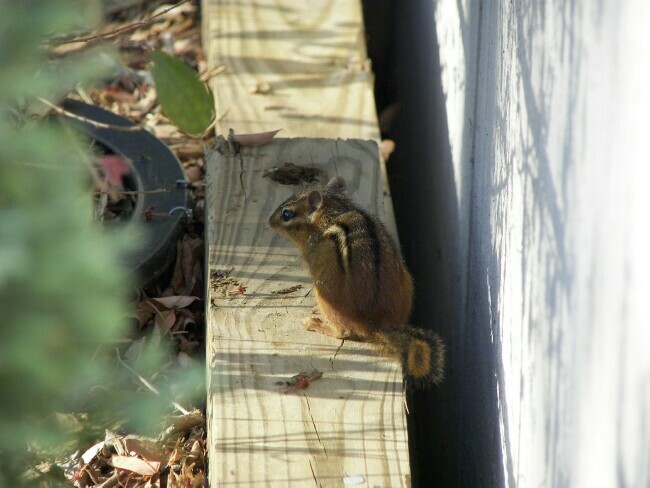 WILDLIFE AT OUR WHITE STONE MANOR: The wildlife that thrives at our White Stone Lake provides our guests with endless hours of entertainment. 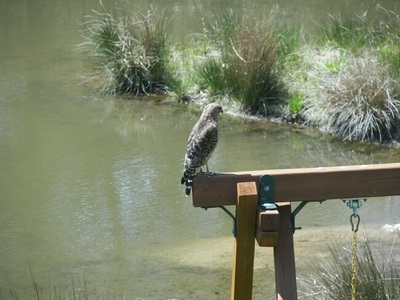 We have a huge variety of birds including ducks, geese, blue herons, king fishers, hawks and falcons that regularly fish the lake. 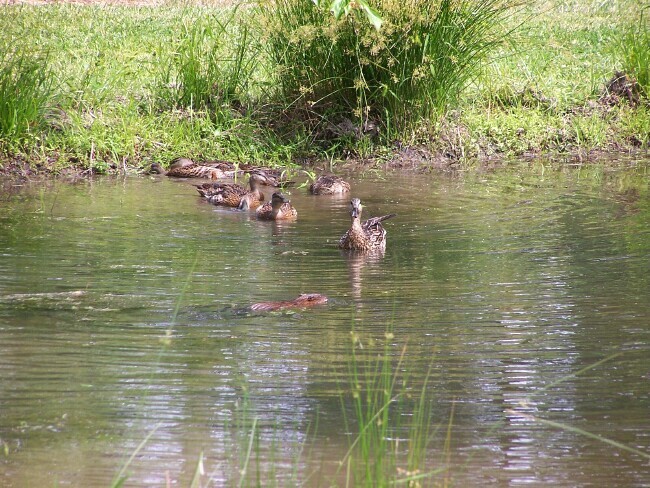 On warm sunny days you'll see our huge lake turtles rise to the surface to sun themselves. There are rabbits, chipmunks, muskrats (little beavers), rare white squirrels and lots of gray squirrels that live here. 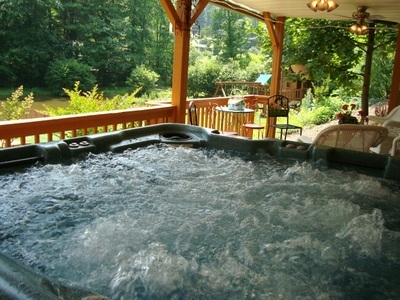 YOU ARE INVITED TO BE SPOILED! 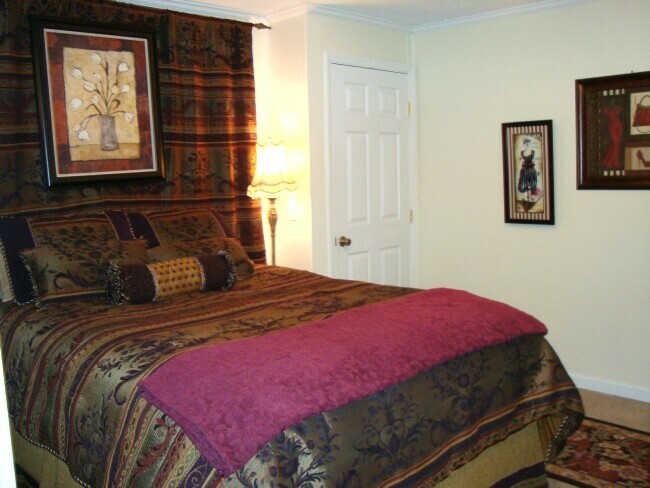 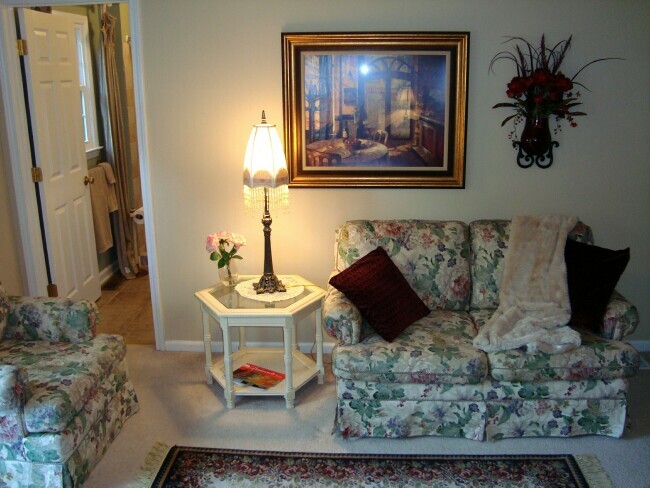 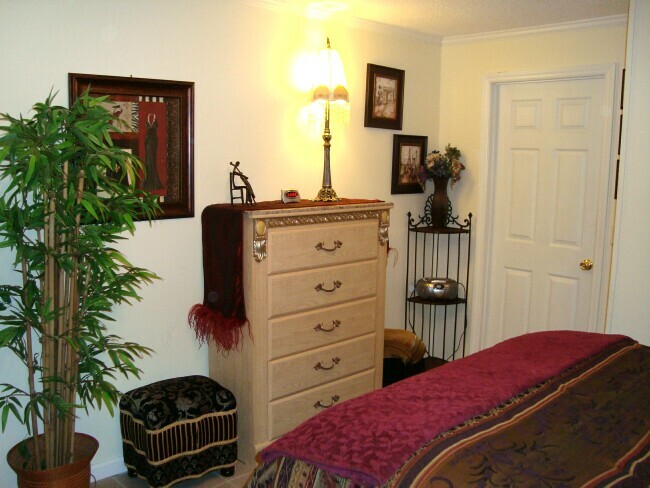 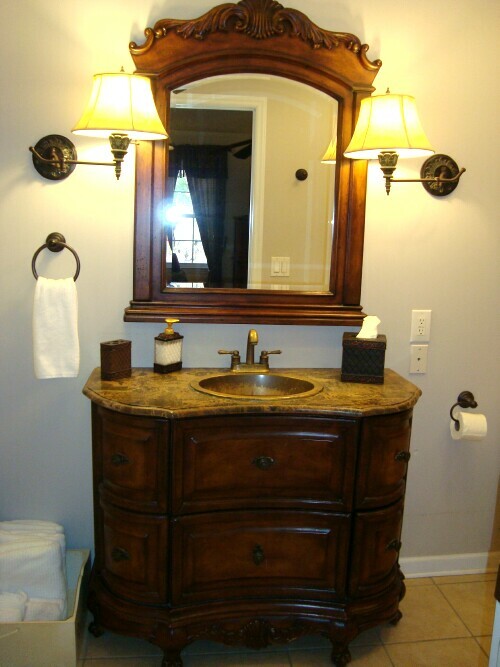 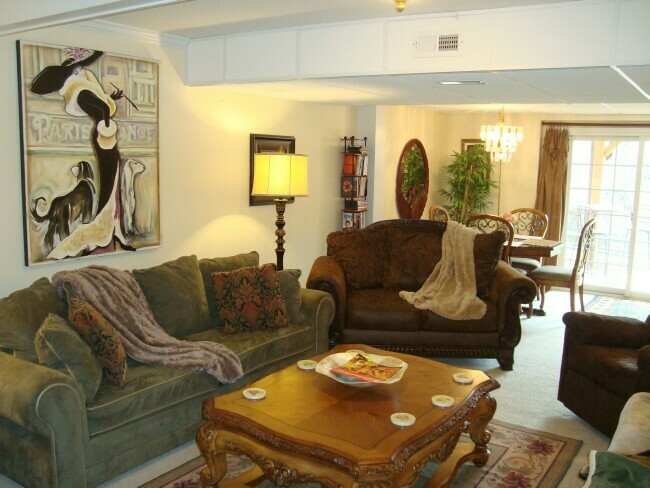 I am a local Asheville, NC owner who take exquisite care of my home and YOU! I am available anytime to see to your needs. 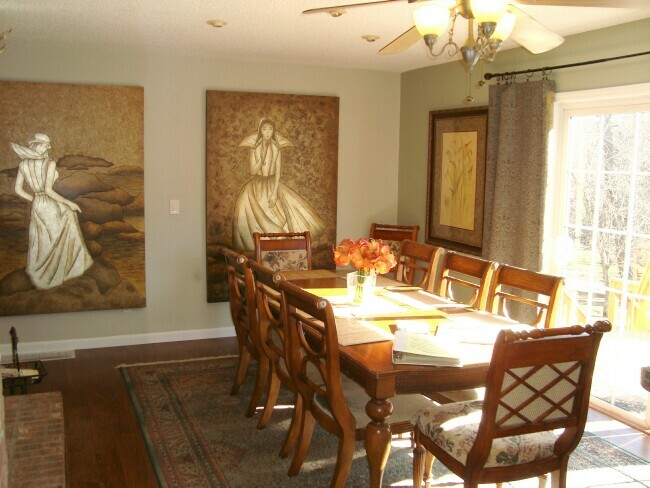 You'll appreciate the tasteful decor and thoughtful care this home reflects. 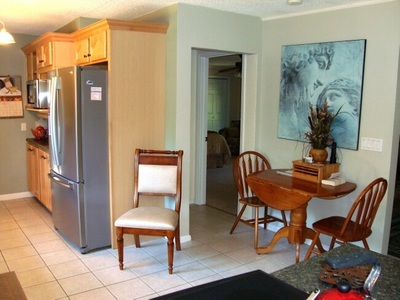 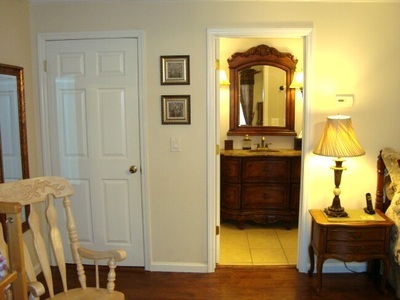 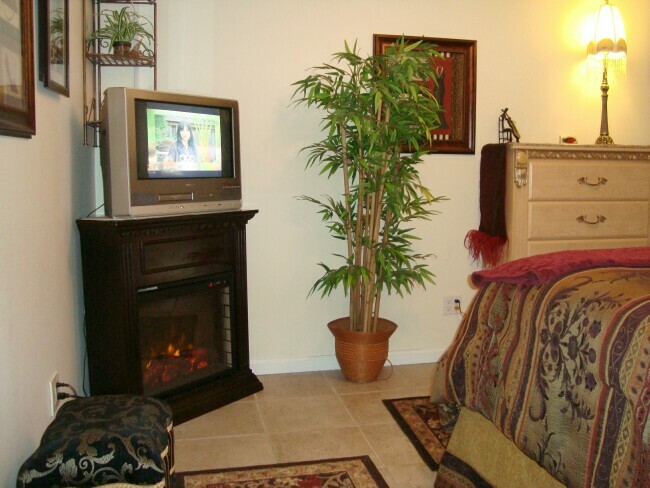 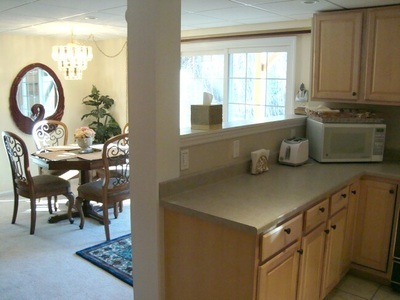 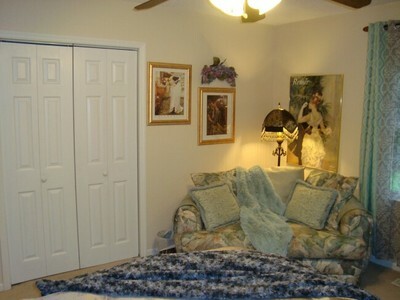 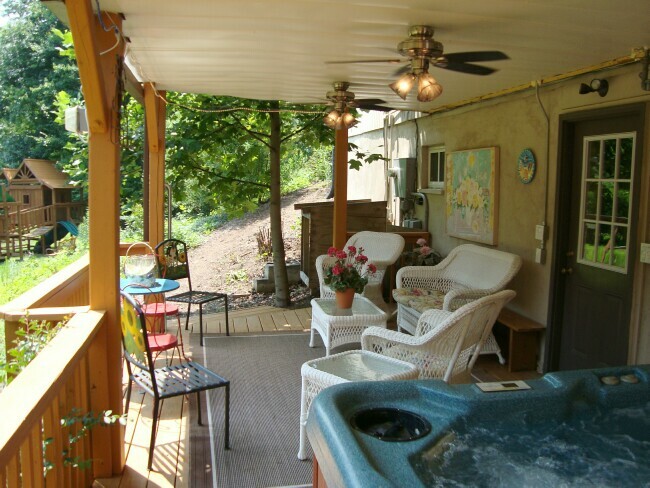 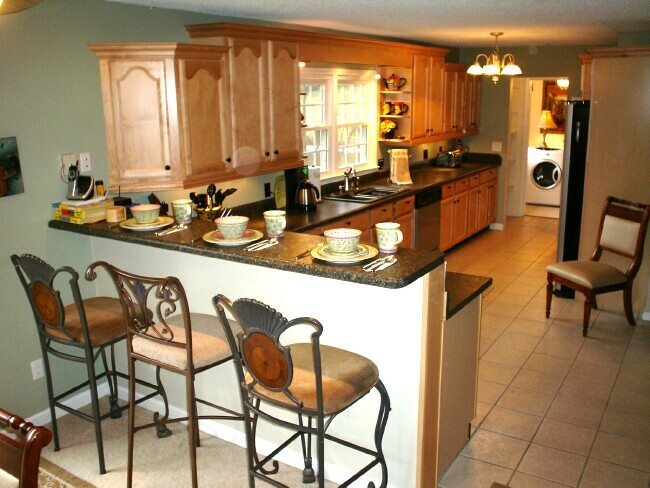 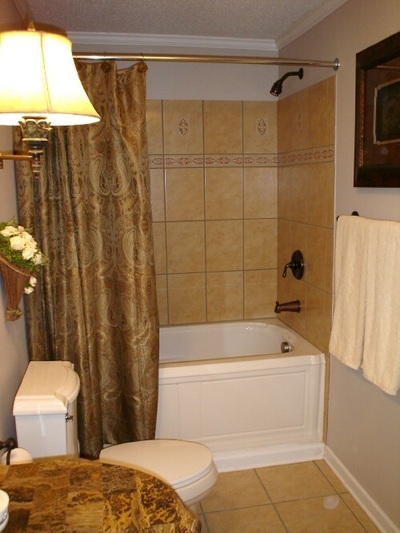 You will find the home exceptionally clean, meticulously well-maintained and the hot tub sparkling with fresh water. 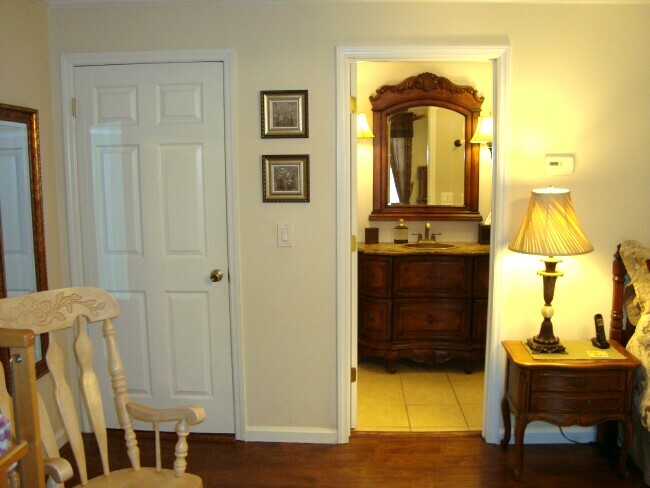 The thoughtful little extras provided will make you feel that you’re staying at a best friend’s home rather than a rental house. Plenty of Hot Water with TWO 80 Gallon Water Heaters!